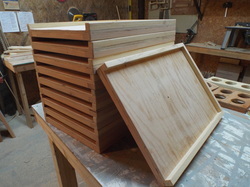 These are the hives I build and sell. Shipping for ONE (1) complete hive with foundation-less frames is over $80.00 So I don't ship. If one day the stupidity of shipping becomes reasonable I will begin doing so. You can have what ever color you like, as long as it happens to be the color I am currently painting! I use MEDIUM boxes. I can build Deeps, but a 1x12 is twice the cost of a 1x8. 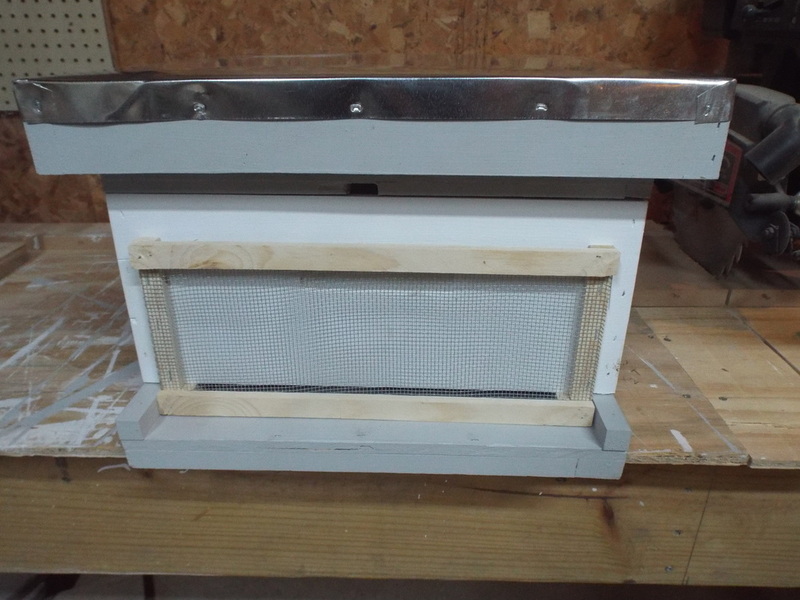 I sell a complete hive WITH foundation-less frames for $140.00. 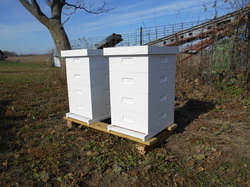 Without the frames I get $100.00 per hive as pictured. 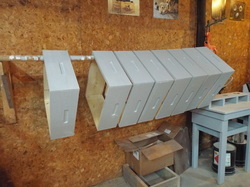 Medium Hive box; Assembled and painted $15.00 Each. Reversible Inner cover; Assembled and painted $15.00 Each. Pictures of each of these items listed below. Standard Langstroth 10 frame width. 1/2 inch plywood floor, Pine rails. 3/4" standard spacing top. Bottom is 3/4" by 1.5" border that goes all the way around for strength and longevity. Not designed to be flipped for smaller entrance opening. These Bottom boards are glued and nailed, they will NOT pull apart. Pictures below for better detail. Medium Hive Bodies/Supers 10 frame. Rabbited corners, well glued and nailed. 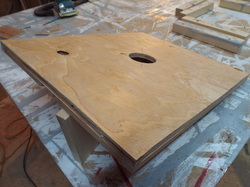 Hand holds Routed with a jig to be uniform and even. Hand holds are tapered to prevent water from sitting in the handhold area. Painted and assembled. Inner cover, Standard Commercial style. Standard 10 frame Langstroth size. This piece is made from 1/2 plywood with a 3/8 rim around one side. There is a notch on the front side of the rim that is 3/8 by 1 to 1.5 inches. The Centers hole in these covers fit a mason jar with a small mouth lid. This is the one I use. Similar to the above inner cover, except it has a two inch rim on the flat side of the above cover. This one can be flipped to make room for winter patties, sugar, etc.. More pictures below. Mine are 1/4 inch wider and longer than commercial inner covers to allow for variation in boxes and wood thickness. The 1/4 inch greater length also allows easier access to the upper entrance, and still allows the cover to be slid back to close that entrance. 1/2 Plywood with a 3/4" by 2" pine rim. Metal tops; I still have a few tops with metal on them, most do not. I can put metal on the tops for an additional $3.00 per tele cover. I typically put metal on all the covers I sell, so if you wish to do without make sure to let me know before I build them. A few pics of them below. Well painted woodenware will hold up for many years of use if some measure of effort to maintain them is taken. Corners get chipped, bottom boards get scraped and the wood will begin to rot. The stuff I build is designed to hold up well, and still be cheap enough that it can be replaced when it eventually begins to succumb to the elements. 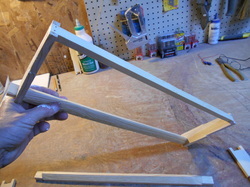 I make my own as pictured, with a 45 degree angle cut on each side of the top bar leaving a point for foundation - less. With a point cut into them like the picture to the left, Grooved for plastic, or wedge style for wax can be seen below. The choice is entirely up to you. I typically sell the frames ready for foundation, and let the new owner install that foundation. I can if preferred install the foundation. If I order it and pay for it, it will cost $1.00 installed. If YOU order it and deliver it, installing it is free. Pictures of the different types possible below. 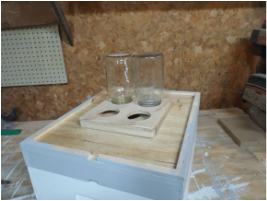 If the single hole for one jar is not enough for you, then one of these 4 jar feeder stands will do the trick, to get a gallon of syrup over your hive. Just place it over the single hole in the inner cover, and the bees can get right to it. Still keeps them from building burr comb inside the box you cover it with, but gives them a gallon of syrup to get the ball rolling in the spring, or to pack away in their combs in the fall. I sell these for $5.00 each and usually have a few ready to go. Robbing screens! The idea for these goes to Wally Swaim, who posted pictures of how to do them on WWB Forums. I added the "feet" that slide into the entrance and hold the screen in place. They are made with #8 hardware cloth and 3/8 pine strips. If your starting hives, or end up with a weak hive, having at LEAST one of these is absolutely necessary! I sell these for $5.00 each and TRY to keep them in stock. The ones for the nucs are a dollar less. These end tables are amazing at getting a conversation going as soon as they are noticed. The bottom board is solid pine. 3/4 and 5/16 spacing respectively. Three medium boxes. Two are filled with frames. The bottom box houses the light. There is no inner cover, the telescoping cover is inset with tempered glass allowing viewing down through the frames. Three coats of Urethane, sanded between each coat. The wood is selected from what is available to HAVE knots, blemish's and lines to add character. 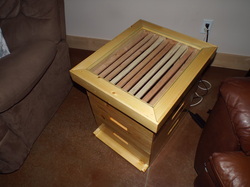 For all intents and purposes, you could remove the light in the bottom, install frames, add an inner cover and fill this with bees. 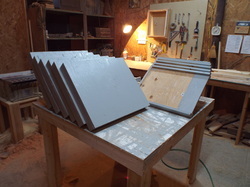 The boxes are doweled together, not glued so it can be disassembled, yet it will not slip or slide if bumped or moved. These sell for $300.00 each. Email me if you want one, it takes about a week to build one start to finish. Pick up only. The cost of shipping is pure stupidity. If your rich, and you want my products shipped, I will, otherwise, please pick up your orders in person! I try to keep some of each product on hand for fast delivery, but larger orders will require the time to assemble and paint before shipping. Time is dependent on the size of the order. When I am swamped with orders, like right now in January, it also may take a little longer to get orders together. Please Email with questions from my contact page. I will reply as quickly as possible!